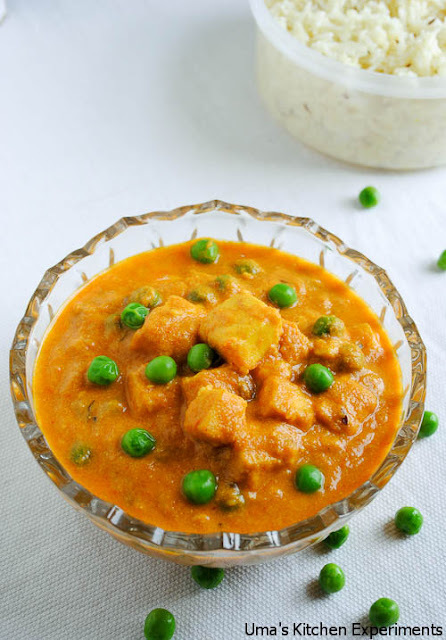 Mattar Paneer recipe is nothing but a creamy gravy recipe prepared with peas and cottage cheese. This North Indian recipe is rich in taste and pairs well with roti, chapathi and naan. 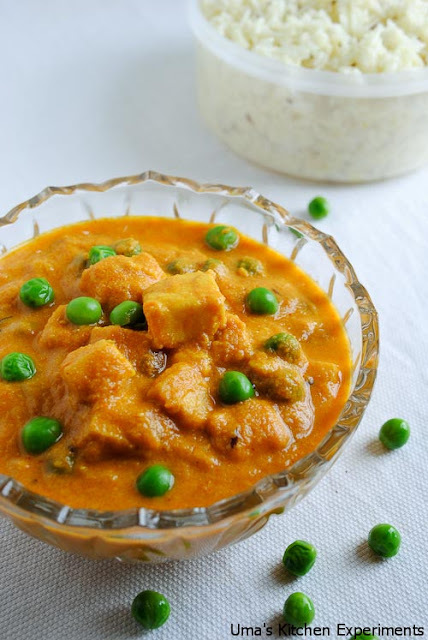 The paneer which I used here is the ready to use paneer available from any grocery shop. Here I present you this mouthwatering recipe. 1) Take a kadai / frying pan and heat butter in it. 2) Fry the paneer till they turn to golden brown colour. 3) When Paneer turns to golden brown, remove them from pan and allow it to cool down. 4) In the same kadai, add onions and saute them. 5) When onions are half fried, add ginger - garlic minced mixture. 6) Saute for a minute. Then add tomato and turmeric. 7) Wait till the mixture gets completely mashed. Then, turn off the stove and allow the mixture to cool down. 8) Grind the mashed ingredients well using a mixer/food processor. 9) Take another kadai, add oil in it. 10) In a low flame, heat the oil and then add crushed cinnamon, cloves, bay leaves, cumin seeds and green chillies one by one. 11) Allow cumin seeds to splutter. 12) Add the ground mixture to the kadai and also add red chili powder, coriander powder, masala powder and salt. 13) Stir fry the mixture. Now turn the flame to medium. When gravy starts to thicken, add peas(cleaned). 14) Cook for few minutes and then add paneer. Fresh peas should cook within five minutes. 15) Cook till the gravy is thick enough as you like. Then, turn the flame to very low level and add curd / yogurt. 16) Stir fry the contents and after 2 minutes turn off the stove. 17) Garnish with coriander leaves and Serve hot with Roti / Naan. 1) If you have fresh home made paneer, you can directly use them without frying. 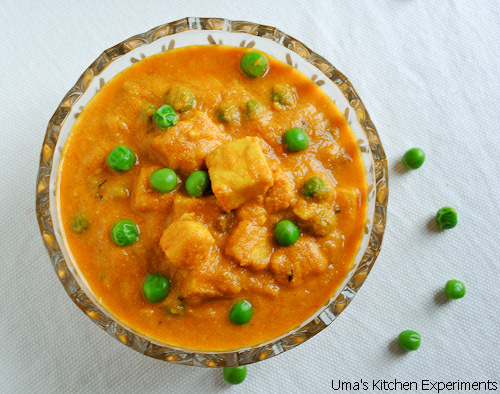 If your paneer is not fresh, you can add them in warm water before frying for softness.